Volcano Watch: Do recent changes herald the opening of a new vent on Pu‘u ‘Ō‘ō? This video shows a virtual flyover of Pu‘u ‘Ō‘ō, the active vent on Kīlauea’s East Rift Zone. The 3-D model was constructed from thermal images collected by USGS Hawaiian Volcano Observatory geologists during a helicopter overflight on April 18. In this model, the active lava pond in west pit, a small crater adjacent to the main Pu‘u ‘Ō‘ō crater, appears hotter (bright yellow) than the surrounding area. The floor of the main crater has been uplifting due to increasing pressure within the magma system beneath Pu‘u ‘Ō‘ō. For scale, the main crater is about 280 m (920 ft) in diameter. In recent years, scientists have made significant improvements in developing sophisticated models of how volcanoes work. The ultimate goal is to develop models that allow us to forecast new activity. Despite these advances, operational volcano monitoring still relies primarily on “pattern recognition.” In other words, scientists look at current monitoring data and compare it to past patterns and similar eruptions to anticipate when and how a volcano may erupt in the future. A clear pattern of activity has recently developed at Pu‘u ‘Ō‘ō, the current vent on Kīlauea Volcano’s East Rift Zone. Since mid-March 2018, tiltmeters and GPS instruments have indicated rapid inflation at Pu‘u ‘Ō‘ō. Small lava flows have also erupted on the Pu‘u ‘Ō‘ō crater floor. Most striking, however, are webcam images showing that the main Pu‘u ‘Ō‘ō crater floor is slowly uplifting like a piston—pushed up at least several meters (yards) in recent weeks, and again in recent days. Additionally, the lava pond level in the west pit, a small crater west of the main Pu‘u ‘Ō‘ō crater, has risen at least 7 m (23 ft) since March 27! The pond is now “perched” above the floor of the west pit, where overflows have incrementally built up the pond rim. This is reminiscent of past Pu‘u ‘Ō‘ō lava pond activity. These changes indicate building pressure in the magma chamber beneath Pu‘u ‘Ō‘ō. While inflation and uplift of the crater floor are unusual compared to recent activity at Pu‘u ‘Ō‘ō, it is not unprecedented. This pattern occurred two other times in the past five years—in June 2014 and May 2016—as well as in earlier years of the eruption, most notably in 2011. In each of the two most recent cases, the building pressure culminated in the opening of a new vent on the flank of the Pu‘u ‘Ō‘ō cone. The June 27, 2014, vent marked the beginning of the “June 27th flow,” and the May 24, 2016, vent marked the beginning of the ongoing episode 61g lava flow. Assuming that the current changes result in a new vent opening on or around Pu‘u ‘Ō‘ō, the main question is, “where exactly will the vent appear?” Unfortunately, scientists are not able to determine with certainty where a new vent might open. But, it’s an important question, because the accompanying hazard will largely depend on the location (and duration) of the vent. With the June 27th flow, the vent opened on the northeast flank of Pu‘u ‘Ō‘ō and sent lava flows down the north side of the East Rift Zone. Over the course of many months, these lava flows advanced toward the community of Pāhoa, eventually posing a threat to residential areas. The 61g vent opened about 400 m (440 yds) east of the June 27th vent, sending lava flows to the south of Pu‘u ‘Ō‘ō, often within Hawaiʻi Volcanoes National Park. These ongoing flows have not posed a threat to nearby communities. On September 21, 2011, a fissure on the upper east flank of the Pu‘u ‘Ō‘ō cone drained the lava lake within the Pu‘u ‘Ō‘ō crater. This vent fed lava flows that advanced to the southeast, mostly through Hawaiʻi Volcanoes National Park. When lava bursts through the flank of Pu‘u ‘Ō‘ō, areas immediately around the cone are extremely dangerous. On August 3, 2011, the Pu‘u ‘Ō‘ō crater floor collapsed and lava breached the flank of the cone, sending a fast-moving lava flow to the southwest. The initial breach sent a broad flood of lava traveling at speeds faster than a person can run. The August 2011 event is a reminder of why areas on and around Pu‘u ‘Ō‘ō remain closed to the public. The volcanic hazards associated with Pu‘u ‘Ō‘ō, especially with the recent changes in activity, should not be taken lightly. While current circumstances indicate an increased likelihood of changes at Pu‘u ‘Ō‘ō in the coming weeks, there is no guarantee that the current buildup in pressure within Pu‘u ‘Ō‘ō will lead to the opening of a new vent. It is possible that the current inflationary trend could end with no result. However, because Pu‘u ‘Ō‘ō appears to be at a critical juncture, USGS Hawaiian Volcano Observatory scientists are closely monitoring it and will provide updates if and when conditions change. This time-lapse image sequence taken by a time-lapse camera on the rim of Pu‘u ‘Ō‘ō’s west pit, spans March 20 to April 18. 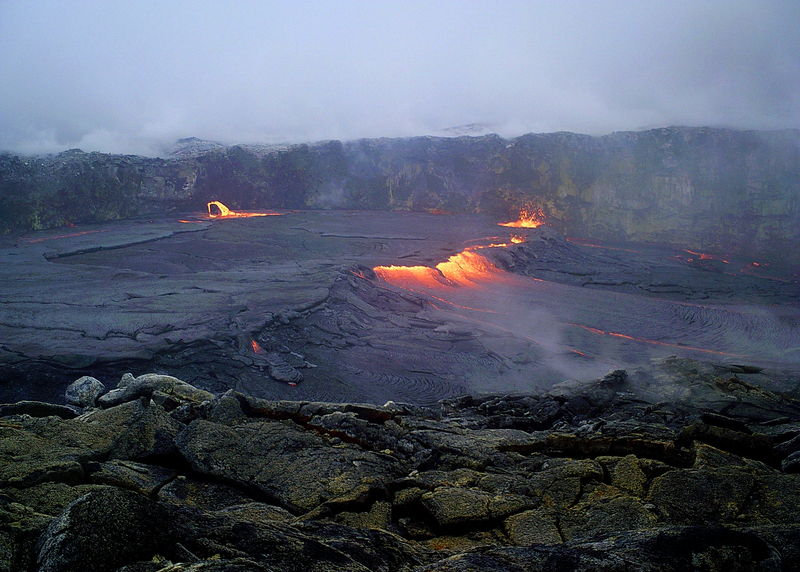 The sequence, of approximately one image per day, shows the growth of the lava pond within the west pit as it developed into a perched lava pond. This sequence is looped 4 times.